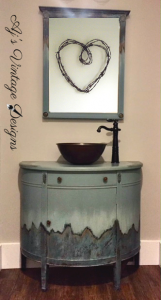 This was my first project using the Dixie Belle Paint Company’s patina products, and now I’m hooked…..I want to patina everything !! Dixie Belle Site Affiliate Link! Let’s get started !!! As you can see in the “before” picture, this piece was a pretty piece in her younger days. Over time, she had yellowed badly in areas and had a strange black “dusting” coming from the fine detailed areas. So I didn’t feel bad about taking my paint brush to her and giving her a make-over. But first…..gotta prep her properly. I gave her a good cleaning with the Dixie Belle White Lightening Cleaner and then wiped her down with a damp cloth to remove any left over cleaning residue. Let’s cover up all that yellow !! 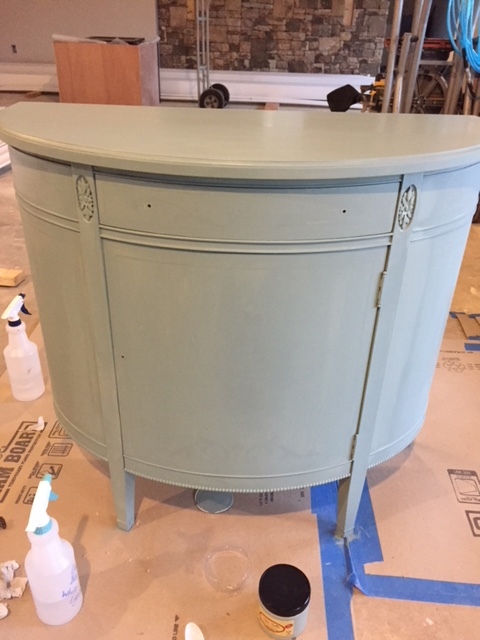 I painted a base coat of Vintage Duck Egg (I could have gotten away with only 1 coat, but added a second coat just to be safe). 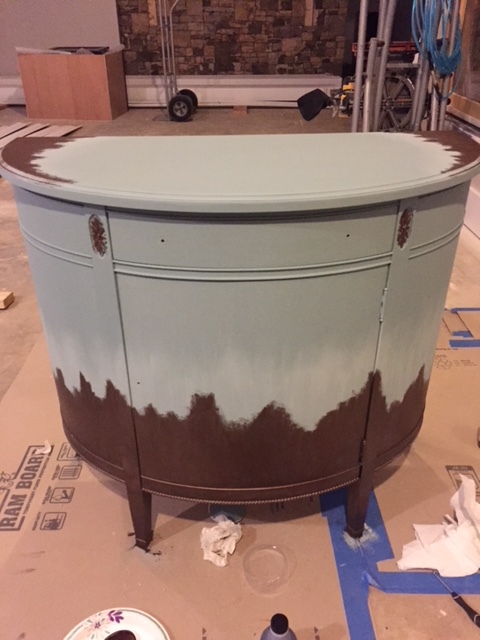 I knew I wanted to do the patina look, so I dry brushed the bottom half of the cabinet (and the out edge of the cabinet top) with the Drop Cloth using a chip brush to add some color transition between the Vintage Duck Egg and where I wanted to the patina. Using a chip brush, with very little paint on the brush, allowed me to get the uneven feathered look for a fun transition between the 2 colors. Now let the real fun begin !!! Patina Time !! To have a successful patina effect, you have to follow the directions……No taking short cuts 🙂 !! I started off painting 1 coat of the Bronze patina paint where I wanted to have the patina effect occur. This coat must completely dry before going onto the next step. If you skip this step, your patina effect will not work. The Bronze color is so pretty, I was tempted to leave it that way and not continue on……but my curiosity got the best of me and I needed to keep going with the patina process. 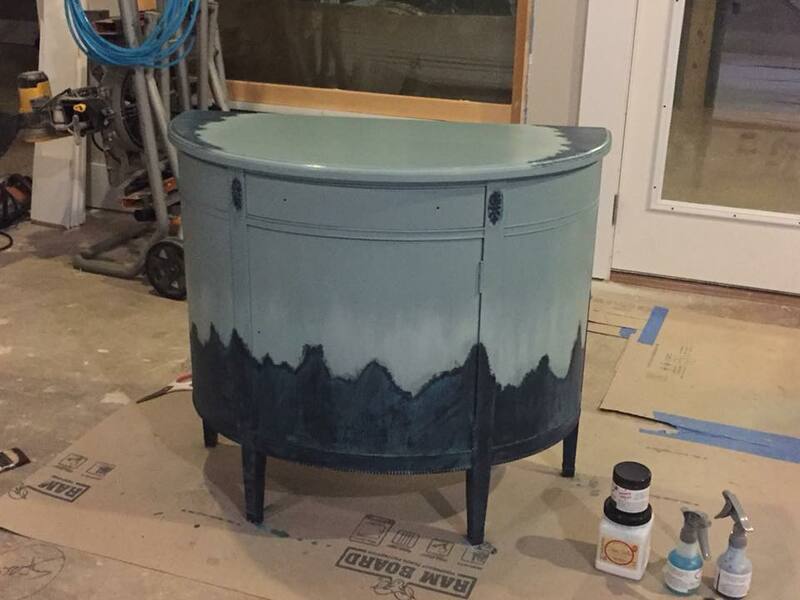 Now that the first coat of Bronze has dried, the next step you need to have your materials ready (Bronze patina paint, chip brush, Blue Patina Spray, and paper towels) because time is critical on this step. Using a chip brush, paint your 2nd coat of the Bronze patina paint in small sections in a dabbing motion (dabbing the paint on gives texture that looks more realistic and gives more “peaks and valleys” for the patina spray to sit in and do it’s magic). I say “small sections” because the Blue Patina Spray needs to be sprayed onto the Bronze paint while the Bronze is still wet (do not let the Bronze paint dry before you spray on the Blue Patina Spray). The Blue Patina Spray Bottle can spray in a soft misting form or a hard stream (I chose to use the soft misting spray. Spray where ever you want the Bronze to have the patina effect (just make sure the Bronze paint is wet when applying the spray). Don’t worry, the Blue Patina Spray will not stain your “non-bronze painted areas”…. just gently wipe any drips or “over spray” with a paper towel. 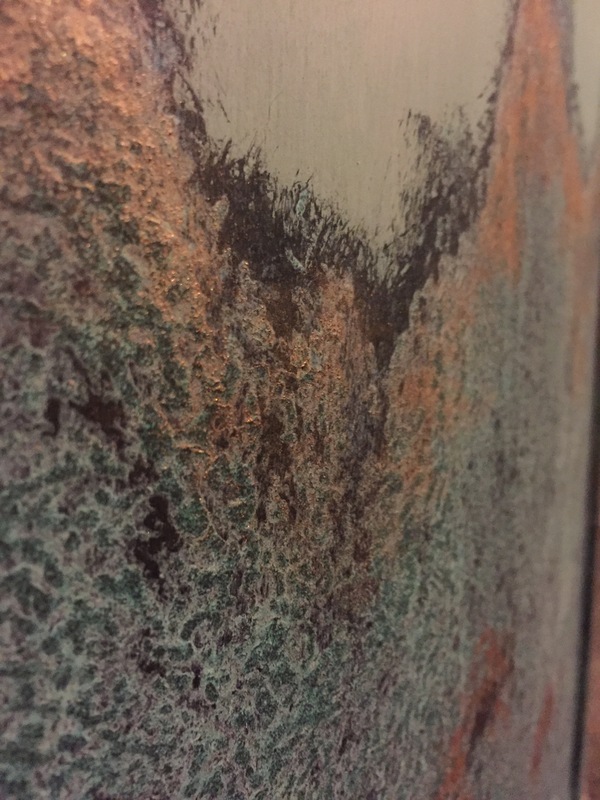 The Blue Patina spray only reacts with the Bronze paint because the Bronze paint actually has metal ground up in the paint that is what the spray is reacting with. The chemical reaction will begin and it actually makes watching paint dry….fun !!! This process can take several hours, so I suggest letting it sit over night so you’re not tempted to touch it or change anything before the process is complete. 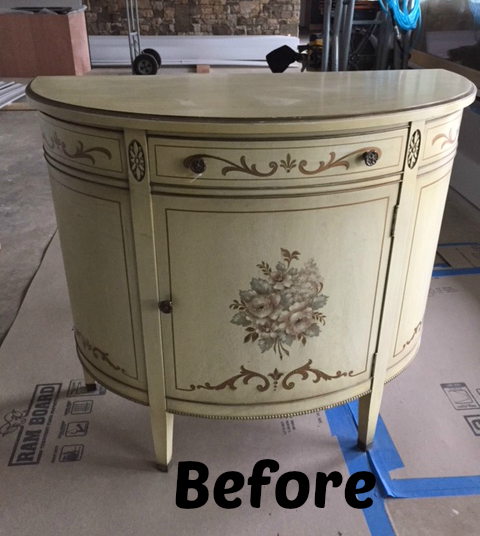 After sitting over night, the reaction is complete….however it does leave a little chalky residue so I took a damp cloth over the patina area to removed the chalkiness. 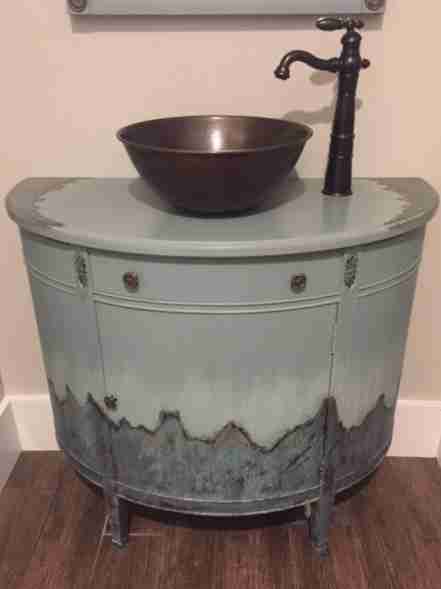 After wiping the area with a damp cloth don’t panic, it will look like you removed your fun blue patina but it will reappear when it dries. I loved this look, but it was missing something. It needed a little more “POP” of color to make it stand out. I decided to add some Dixie Belle Bronze Gilding Wax along the transition edges and in random areas to really bring it all together. I hope you enjoyed this project and I’m on to my next Patina Adventure !! !